The Honda Accord has almost always been a sensible, reliable car that actually won’t put you to sleep in the turns. That’s still the case for 2016. What do you need to know before you buy a Honda Accord? Don’t worry, we’ll tell you everything right here in our Buyer’s Guide. Honda had been selling their Accord in America since the late 70s, and for most of its tenure here in the U.S., it has garnered respect from all thanks to its lightweight construction, excellent reliability, competent handling and always-competitive fuel efficiency. Not to mention, Honda has always offered a manual transmission on at least some Accord variant. That makes us happy. The new Accord sticks with tradition by staying right at, or at least near, the top of the class in handling prowess, safety, and efficiency. And you have tons of options in how you can outfit your Accord. You want 50 MPG city? Buy the hybrid. You want a fun and exciting Accord? Buy the V6 coupe. You want an inexpensive Accord with good fuel economy, tons of safety features, comfortable road manners and still-decent canyon-carving abilities? Grab yourself the sedan. In the Accord, Honda keeps building one of the most well-rounded, solidly-competent cars in an otherwise bland segment, and that’s refreshing. You really can’t go wrong with an Accord. The ninth generation Accord debuted in at the 2012 North American International Auto Show with smaller exterior dimensions, a MacPherson strut front suspension in place of the previous model’s double wishbone setup, an all new interior and exterior, fresh powertrain offerings, and new advanced safety tech. After the new 2013 model, 2014 brought few updates: the cloth seats were updated and an auto-dimming mirror became standard. The following year brought some minor changes to standard features, but the big changes came in 2016. The ‘16 Accord sits atop the same platform as the car shown in Detroit in 2012, but the car looks a lot different thanks to a heavily revised front fascia, new front and rear lights, new wheel and tire options, and fresh interior bits. 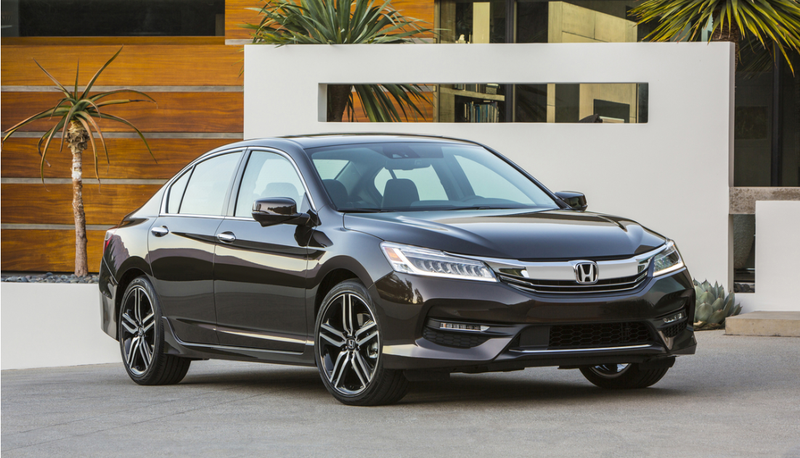 Honda says the Accord gets some structural enhancements for 2016, too, making it stiffer. The suspension also got a bit of a re-tune, and a 60/40 spit-folding rear bench is now standard on most trims (yes, this archaic option was not standard on previous Accords). Because Driver’s Assist tech is “in” these days, Honda Sensing is now available on all trim levels. This includes Forward Collision Warning, Lane Departure Warning, Collision Mitigation Braking System, Road Departure Mitigation System, Lane Keeping Assist System, Adaptive Cruise Control. Apply CarPlay, Android Auto, and a bunch of other cool gadgetry are also new for 2016. While there’s no Hybrid for the 2016 model year, you can still pick up a 2015. When we reviewed a $35,696 top-level Hybrid Touring, it blew us away. That car offers fun handling and a whopping 47 MPG combined. That’s a big number. But while we’d be tempted to find a deal on the fuel efficient hybrid, Honda still offers the enthusiast’s choice: a V6 Coupe with a stick. And that’s the one we’d buy. Of course, it will cost us over 31 grand (gulp), but it comes well-equipped with power leather seats, a 7-speaker audio system with subwoofer, 18-inch alloy wheels, a 7-inch audio display, Bluetooth, dual-zone climate control, a rearview camera, push-button start, projector beam headlights, LED fog lights, and tons of air bags. But really, we’re after that third pedal.